No need to deprive anyone with diabetes of good food! Cook from Fix-It and Enjoy-It Diabetic Cookbook and everybody will be happy. This chock-full cookbook offers more than 500 recipes for stove-top and oven, all appropriate for persons with diabetes. What's more -- these dishes, with their reduced fats and carbs, are healthy for everyone. New York Times bestselling author Phyllis Pellman Good is back with her signature approach to stress-free cooking. "These irresistible recipes have short lists of ingredients -- which are readily available. And the instructions for making each recipe are clear and thorough. These recipes are for cooks who are short on time, and may be short on confidence!" smiles Good. 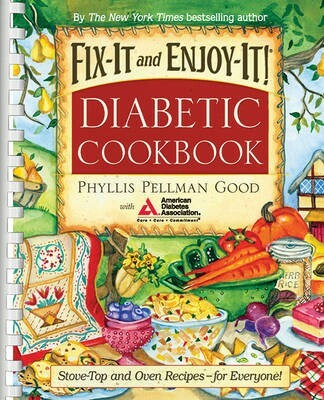 Fix-It and Enjoy-It Diabetic Cookbook comes from a blue-ribbon team. The American Diabetes Association has worked with Good to select the recipes. And they have supplied the Exchange Value and Nutritional Analysis for each recipe. "One more thing to note," comments Good. "These recipes come from home cooks all across the country. they are beloved dishes; the recipes work; the outcomes are already delicious favorites." The book includes "A Week of Menus," for those beginning to cook for persons with diabetes, and for those who need refreshing new ideas. Fix-It and Enjoy-It Diabetic Cookbook makes it easy for persons with diabetes to eat as they should. And you can love this cookbook, even if you don't have diabetes. These recipes are for everyone!